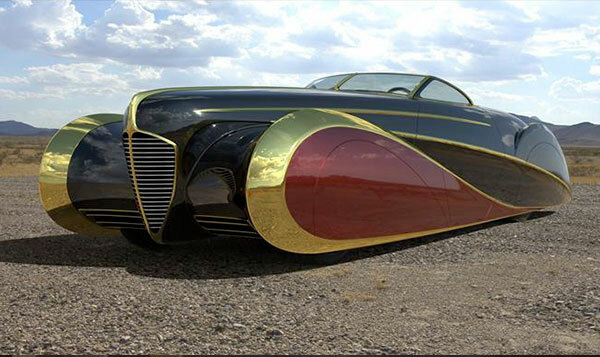 After 18 years of work, our one-of-a-kind, 88% scale, fiberglass and steel replica of the famed Maharaja Duesenberg is for sale. 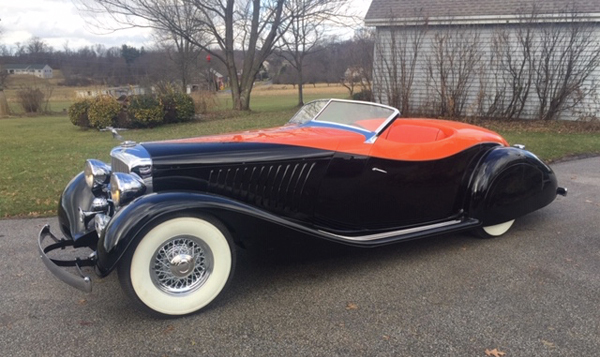 The last Duesenberg ever made before A-C-D went out of business in 1936 was a spectacular roadster built on chassis number 2,614 for Maharaja Yeshwant Rao Holkar (1908-1961) of Indores India. 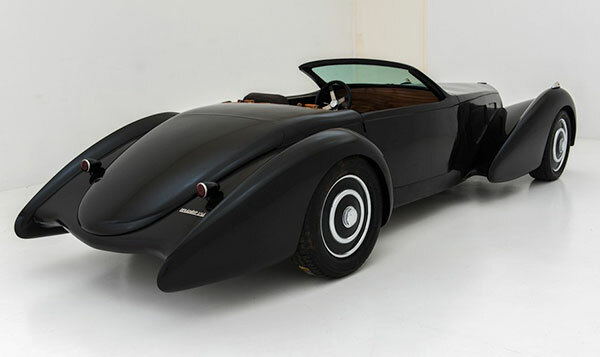 With a one off body made in Croydon, England by coachbuilders Gurney Nutting, gifted designer young John Batchley deserves credit for the sweeping lines. Many feel it is the best looking Duesenberg ever made. Reportedly when it came out of the jungle to be shipped to the USA in 1956, it was cradled in a sling between four elephants! I saw the car at the Louis Vuitton event in New York City in 1999. I was overwhelmed. It is owned by retired Air Force General William Lyons in Orange County, CA. 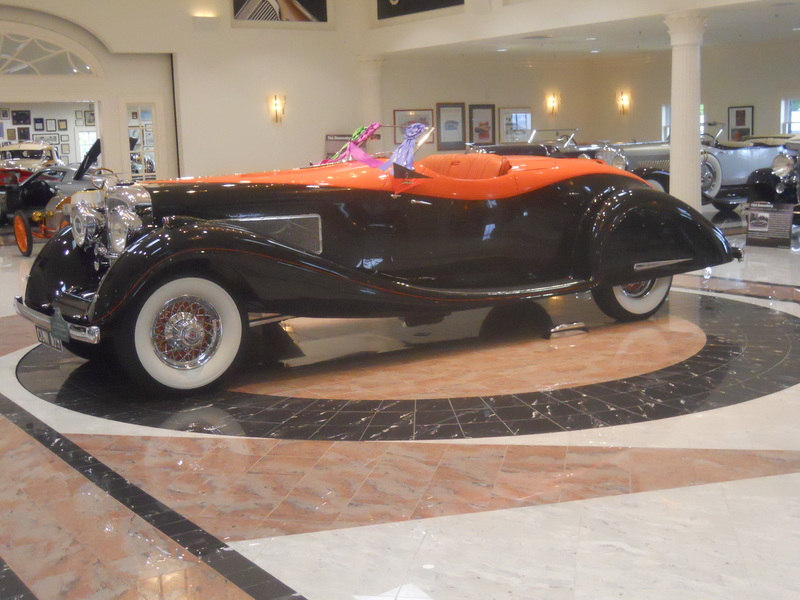 I was allowed to photograph the car in his marble floor “garage” (see photo). If you haven’t heard, Gary Cooper’s similar 1935 SSJ roadster just sold at the Gooding auction at Pebble Beach in Sept. for 22 million. 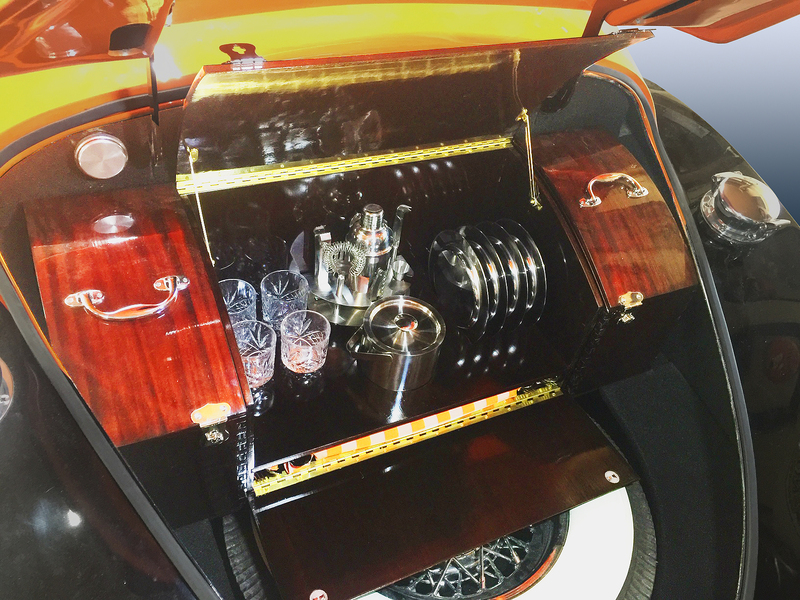 I had my custom ’39 Lincoln on display at the same Louis Vuitton event and Iiterally drooled all over the Maharaja Doozie for three days. 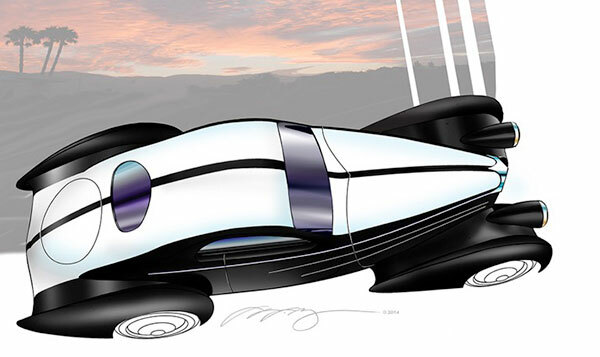 Studying the flowing lines I realized the body was very similar to the 1939 Zephyr fiberglass Deco Rides convertible body I produce. I started the eighteen year task of creating an 88% scale mini-Maharaja using the fiberglass Zephyr convertible body as a basis. 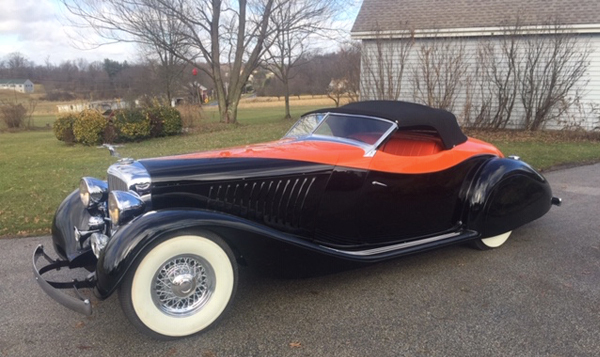 I acquired a steel replica J model Duesenberg grille shell and front fenders built by Marcel Delay of California. I had a steel hood and side panels made, as well as a brass windshield frame. 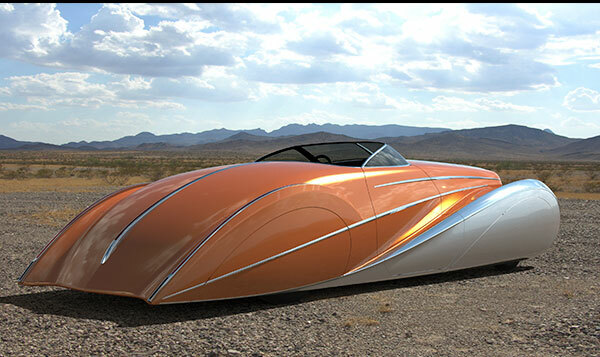 Ed Flanagan did a masterful job of transforming the Zephyr body to copy the Maharaja. 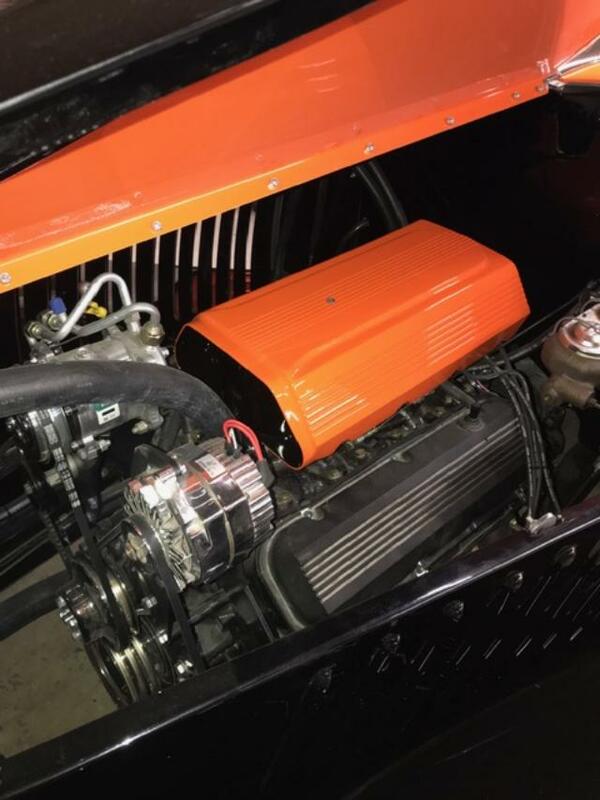 Junior Kelly and the team at Bad Donkey Hot Rods of Hanover, PA completed the project. Chrome by Marty Baker of NEL Metal Restoration in Philadelphia. 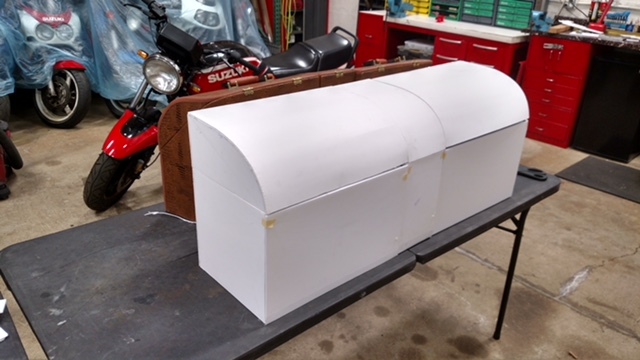 Custom fitted luggage by Brian Matthews of Carlisle, PA. Trim & Top by Mike Sholley. The original car had a massive 153.5 inch wheelbase while our smaller replica has a 135 inch wheelbase to keep the body proportions correct. The car has a new 502 cu. in. big block Chevy and automatic transmission, The idea is to have an affordable mini-Maharaja you could drive and enjoy. It sits on a rectangular steel Fat Man Fabrications chassis with 9-inch Ford rear with an independent front suspension. 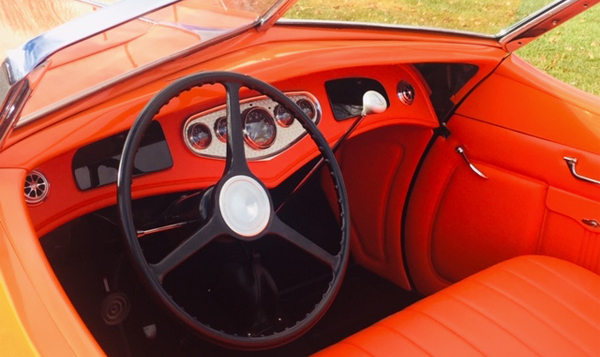 It has “snap-shut” power windows, power disc brakes, power steering, air conditioning and a defroster. 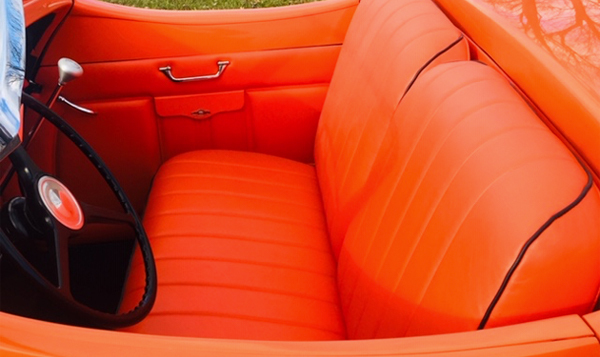 It has a removable top, orange leather interior and custom-fitted luggage. 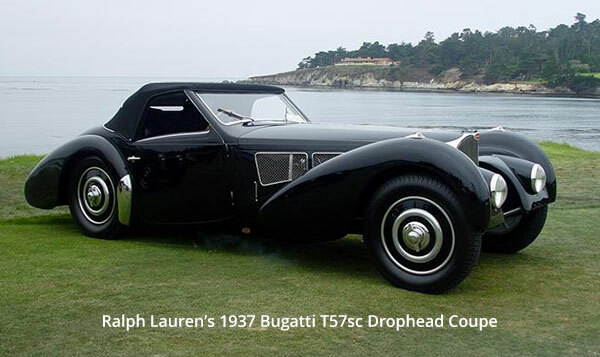 Our unfinished fiberglass-bodied modern day interpretation of Ralph Lauren’s 5+ million dollar masterpiece, his 1937 Type 57sc Gangloff Bugatti drophead (see photo of his car at Pebble Beach). Gangloff is a famed French coachbuilder. Ralph’s car is not for sale, but this tribute replica is so you can absolutely stun the guys at your golf club. 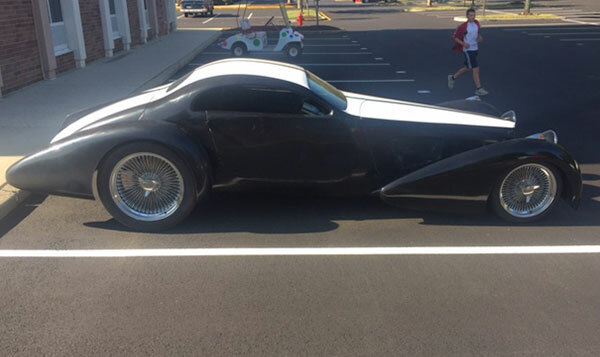 A “poor man’s Bugatti” if you will. Our price below offers a considerable savings compared to buying our body and chassis kit and trying to duplicate the unfinished car we are offering here. 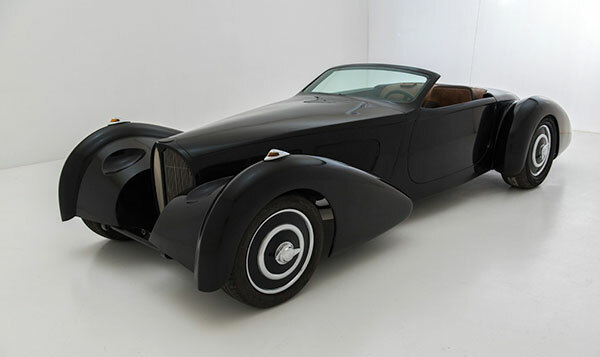 Ralph Lauren has impeccable taste in cars. 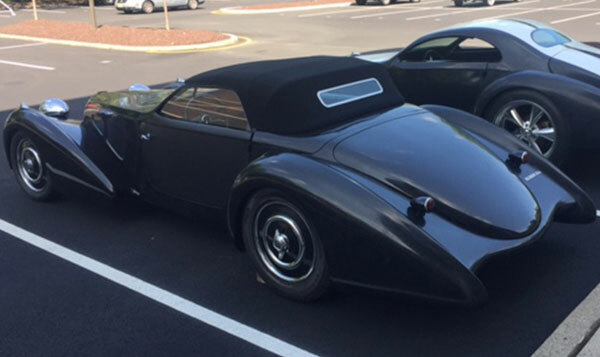 He has only three Bugattis, all of which are incredible including his 40 million dollar Atlantic. 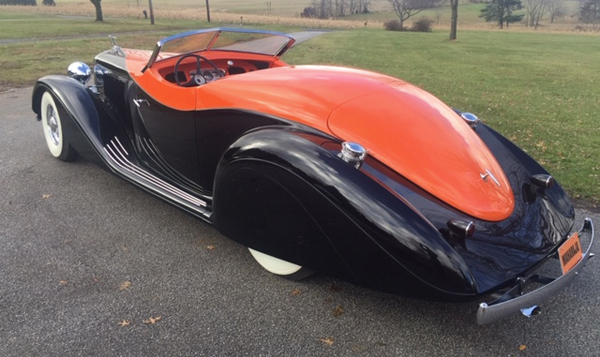 When we saw his 1937 Type 57sc Gangloff drophead at Paul Russell and Company’s shop in Essex, MA we launched a 15 year quest to build a modernized replica that we could afford. Our “Tribute” car has a convertible top with fixed windshield posts and working power windows installed so the car can have air conditioning. 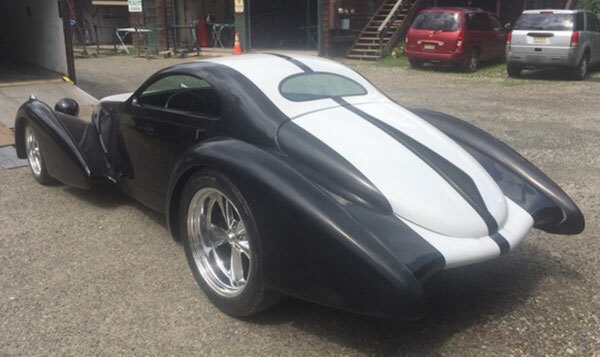 DELAHAYE USA fiberglass body kit ($12,900) mounted on our rolling chassis ($14,300). 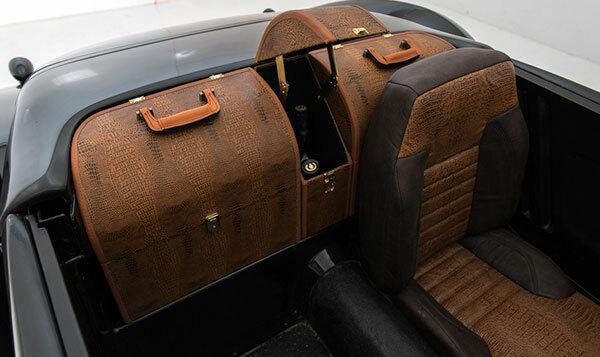 Beautiful folding top hides away completely in special boot between trunk and passenger’s compartment. 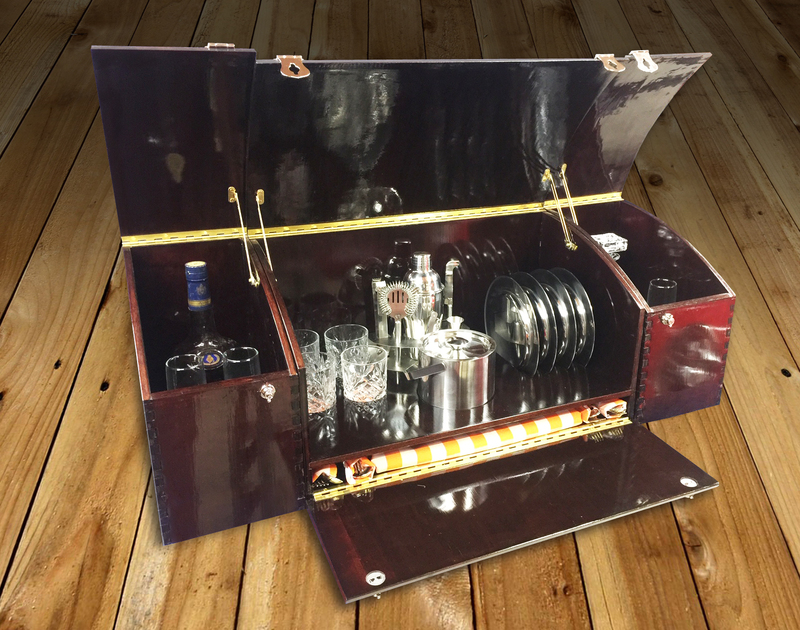 Hinged trunk, hinged convertible top boot cover, hinged and latched doors. 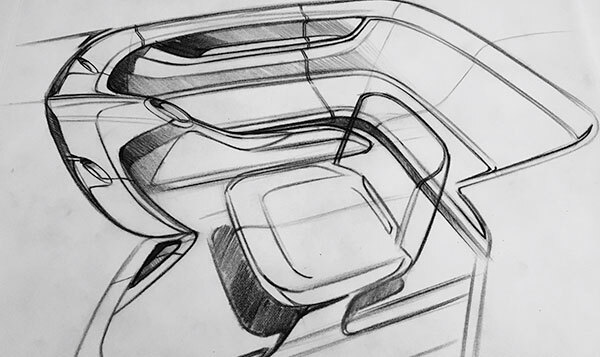 With a 127-inch wheelbase, ten inches longer than the original Bugatti, there is considerably more interior space. Headroom and legroom for a 6 ft. 10 in. basketball player. Shoulder to shoulder room for two NFL tackles. Just forward of the storage boot for the top there is a sculptured rear passenger compartment bulkhead (see magenta photo). It runs across the rear of the interior to provide structural rigidity and support to the B-posts and suicide door hinges. 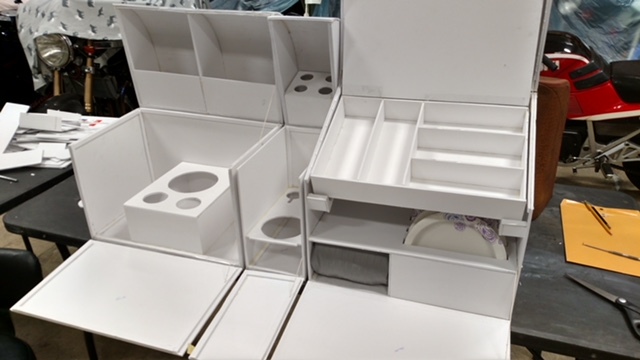 This shelf is designed to accept three curved, custom-fitted suitcases designed to artistically fill the space (included). They tuck upright behind the seats. 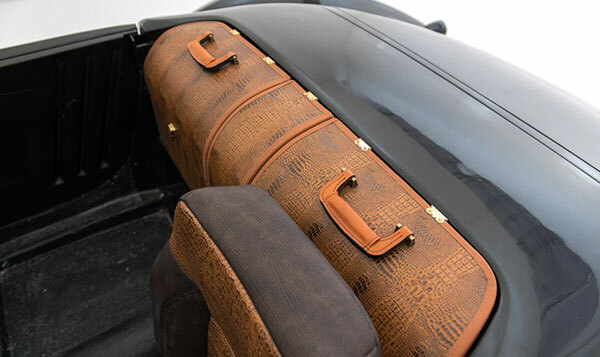 Our three custom suitcases shown are covered in faux alligator fabric, but you can redo them in any fabric you choose to match your interior. The center suitcase is narrower and holds your choice of a Magnum of champagne or a large bottle of Congac. A vertical leather strap (not included or shown) running through the handle would secure each suitcase. 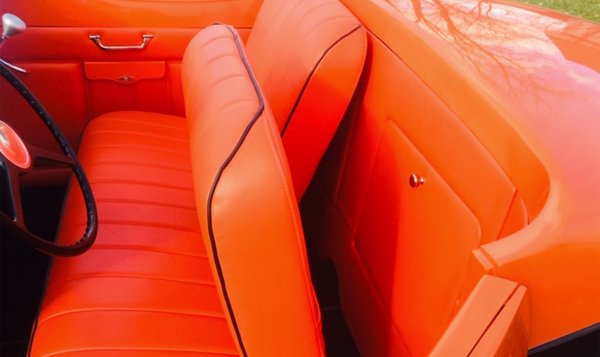 There is one new bucket seat in the car that we are not satisfied with and want to replace. 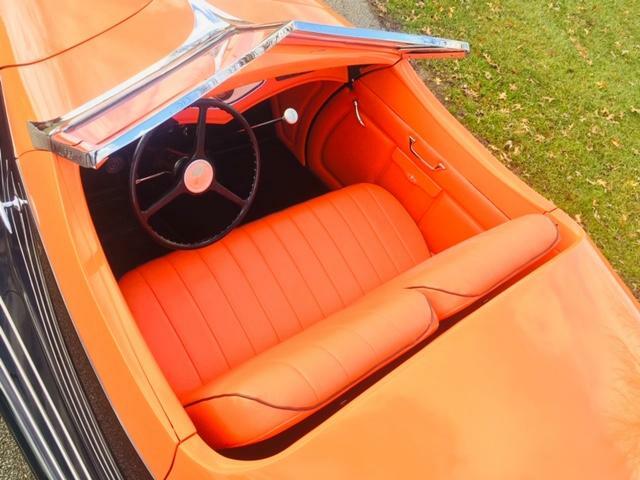 We suggest one with front-rear adjustment on tracks with a reclining seatback. 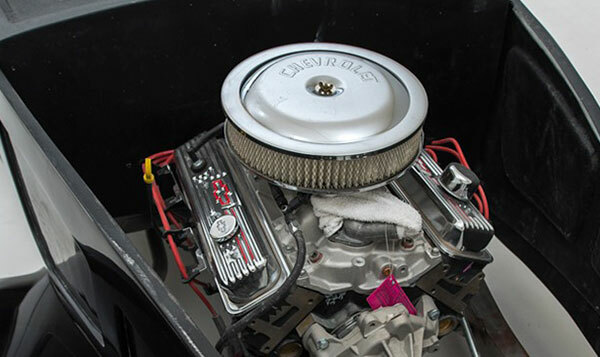 Car offered here includes brand new small block Chevy V8 crate motor with 4 bbl. carb & new automatic trans. installed. High quality rolling chassis by Gary Brown of Brown's Metal Mods in Port Leyden, NY (one of my favorite rod builders). We start with custom made tubular frame rails by Art Morrison Performance in Fife, WA. They are bent specifically for our Type 57s Bugatti replica. We use an independent front suspension system with upper and lower control arms, disc brakes, coil over shocks and power steering rack from Kugel Komponents in La Habra, CA. Both Morrison and Kugel have earned a stellar reputation for outstanding workmanship and engineering. It includes a 9-inch Ford rear with axle housing, axles and third member. Disc brakes are included. Rear suspension is a triangulated four link with quality coil over shocks. Includes gas tank with quiet, in-tank fuel pump. 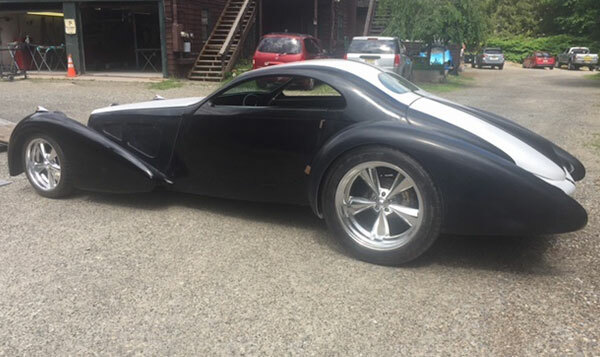 The prototype shown is for sale and includes steel wheels and new radial tires, Bugatti exact replica wheel covers (expensive Lamarr discs), tilt steering column installed with Borgeson steering linkage and steering wheel. 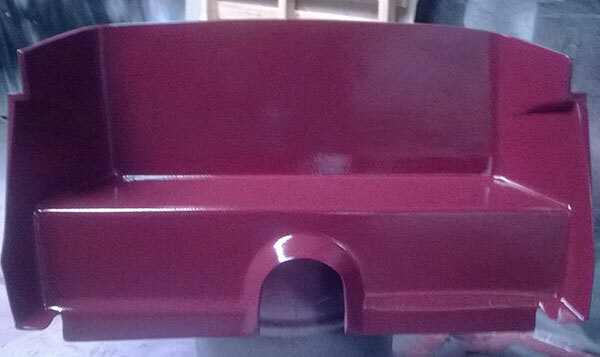 Beautiful redwood dash, under cowl metal support structure, doors hinged and latched with door handles. Two small doors in top of cowl for easy under dash access. Body finished in black gel coat. 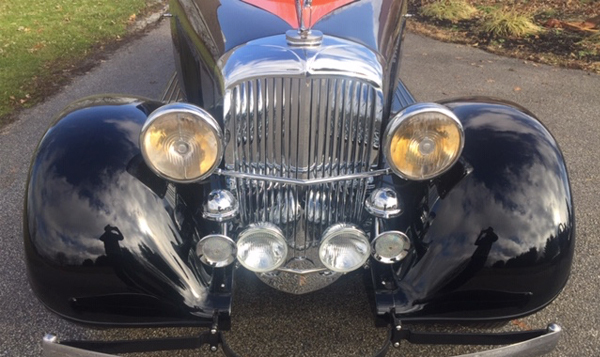 Includes a pair of ’35 Chrysler headlights which have V-d lenses to match the V-d stainless Type 57s Bugatti grille. 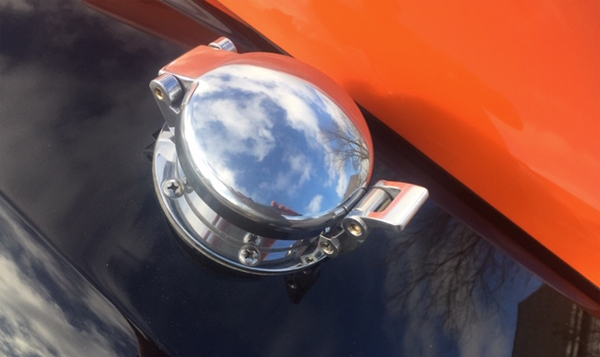 Replica Bugatti front fender marker lights. 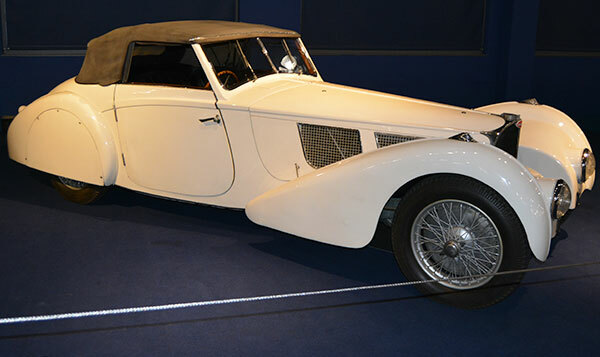 Fender skirts are available (see stunning white Bugatti we photographed at the Schlumpf Museum in France). 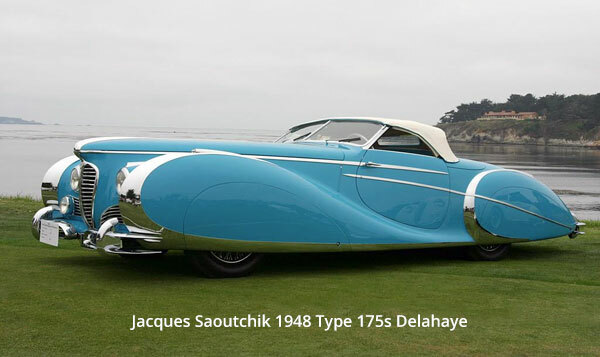 Former Editor of HOT ROD Magazine and CAR and DRIVER staff writer Terry Cook of DELAHAYE USA first saw Ronald Benach’s 1948 Type 175s Delahaye with Jacques Saoutchik coach built body, restored by Fran Roxas, at Pebble Beach 2000. 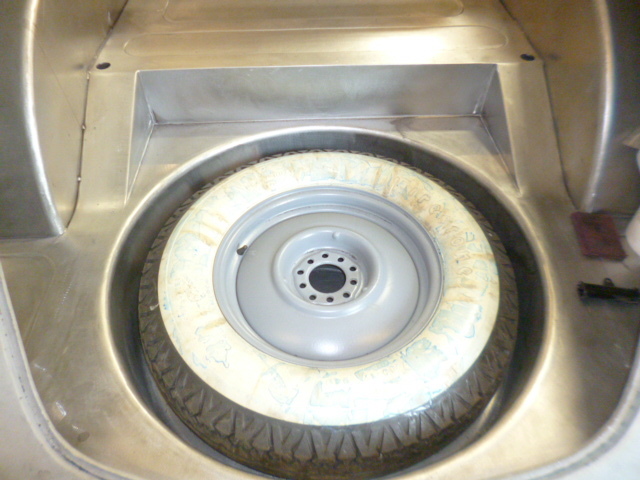 (See photo of turquoise streamliner). 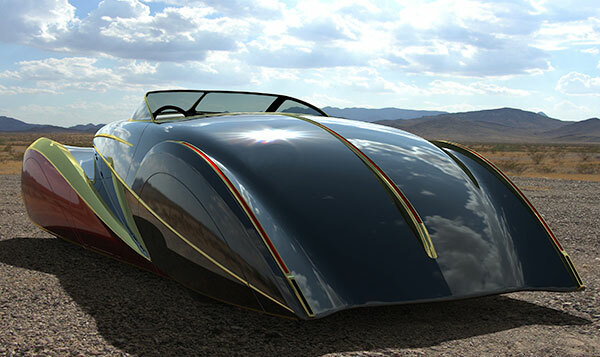 Cook was overwhelmed and hired designer and Art Center grad John Caswell to create a modern day interpretation of a big, fully pontoon-fendered car as a tribute to Saoutchik. 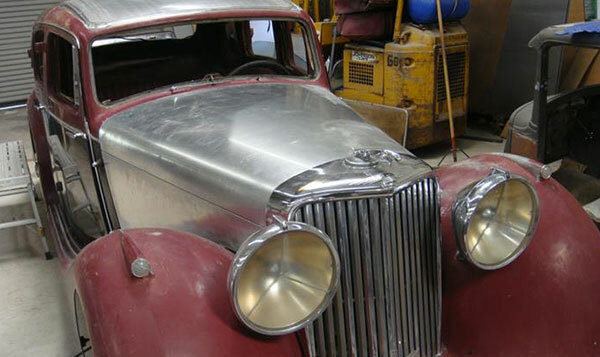 It was dubbed project SULTAN out of respect for the many cars famed Russian coach builder Jacques created in the 1920‘s and 30‘s for Kings and Potentates. They were some of the most beautiful, flamboyant and expensive cars in the world. 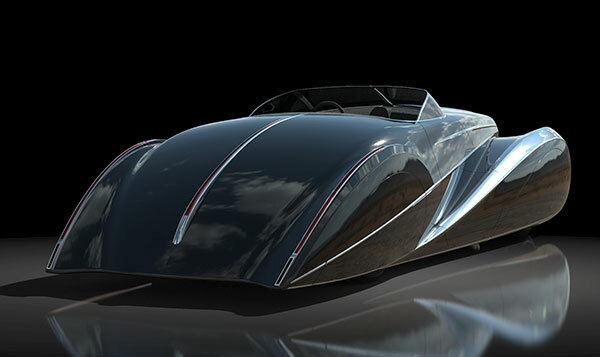 Photoshop renderings show what the car would look like when completed. Primered steel body photos show what our unfinished SULTAN looks like now. Customer picks the final colors. Starting with his scale drawings, John worked with pro clay modeler Todd Storrs in Detroit to build a 1/4 scale clay model which was then digitized. 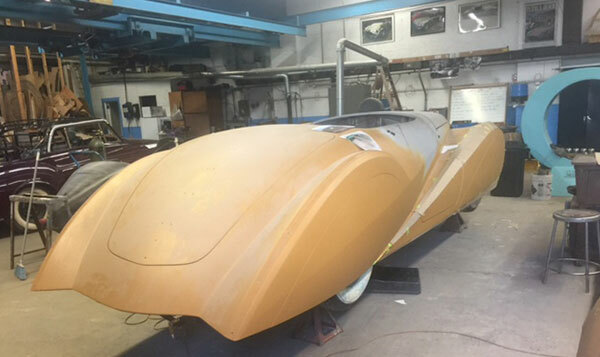 Working with Steve Wilkonski of Revolution Design in Michigan to create the car digitally, a wood body buck was built at a yacht builder in Thailand. Over several years a steel body was then hammered from that buck by Car Kolor in Saatahip, Thailand. It was shipped to San Bernadino, CA where Little Louie Check hand formed the ornate decorative exterior brass body trim shown. 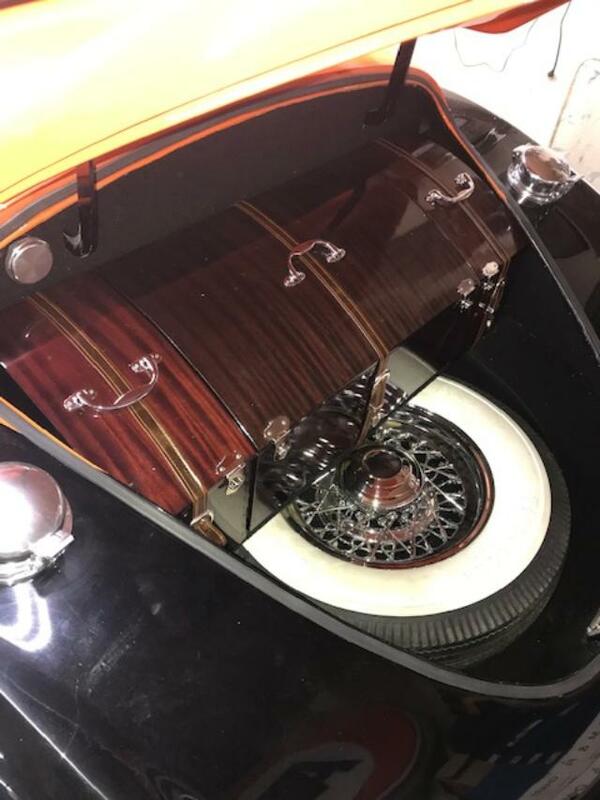 The car is now in master panel beater Tommy Caruso’s shop in Plainfield, NJ having the larger brass exterior trim, the grille, the windshield frame, trunk and interior sculpting done. 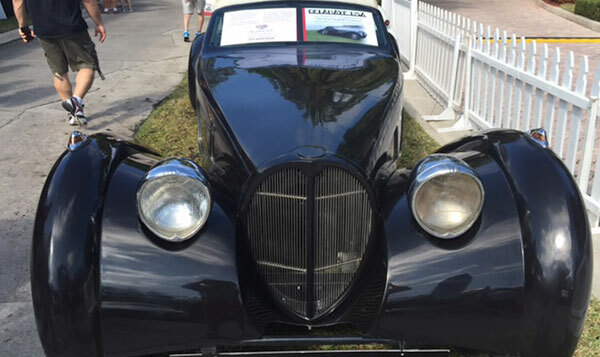 Tommy’s cars have won the coveted BEST OF SHOW Award at the Pebble Beach Concours twice in the past dozen years! 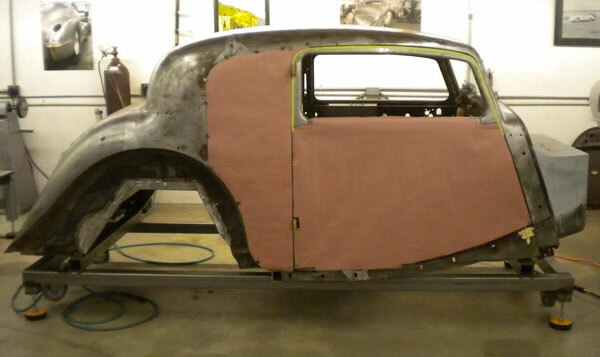 The car is being built as a rebodied Bentley with title and matching VIN plate for the firewall. 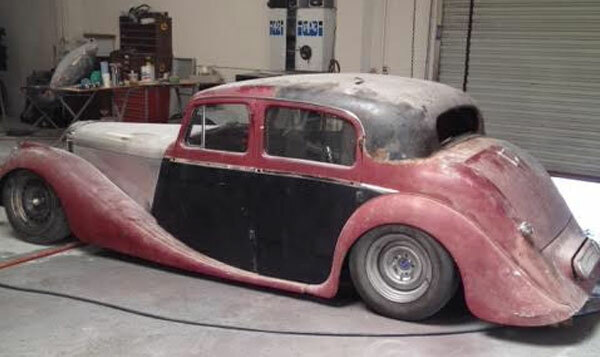 We started with a 1953 Bentley chassis, stripped it to bare metal and added a modern independent front suspension and late model Ford 9-inch rear using coil over suspension and modern brakes. 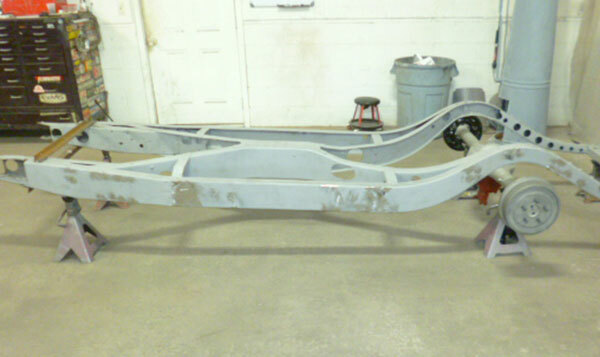 Brown’s Metal Mods in Port Leyden, NY completed the chassis and mounted the body on the frame. 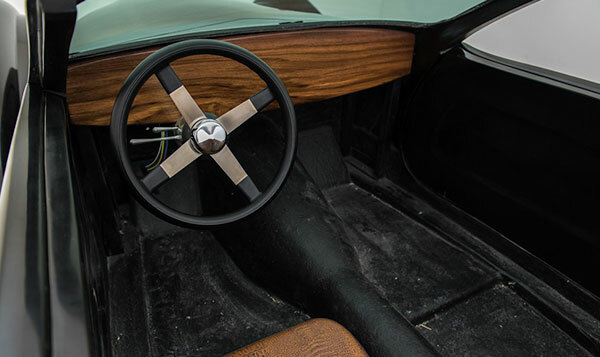 Firewall, full floorboards, and front and rear wheel tubs were fabricated and installed in the car. We wanted something totally unique so we had John Caswell design an asymmetrical interior with a single driver’s seat and a wrap-around couch The trunk compartment would contain custom fitted luggage in the front portion (see Styrofoam mock-up) with a hidden space tire well in the floor. 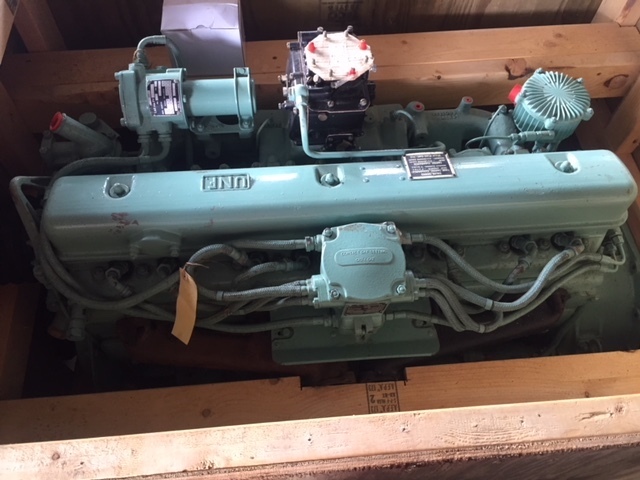 The car has a new old stock B80 Mark Five Rolls Royce/Bentley straight eight engine (never run, still in the crate) and rebuilt Bentley/Rolls Royce automatic transmission. 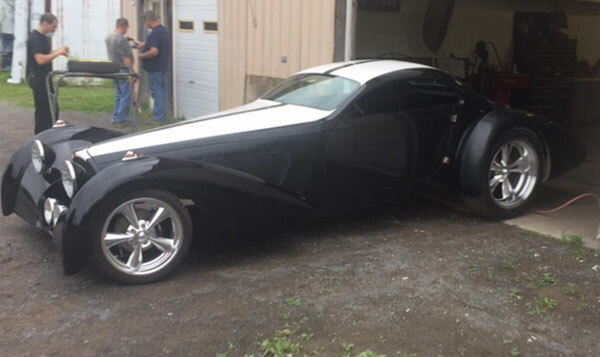 It includes five wheels and wide whitewall tires. 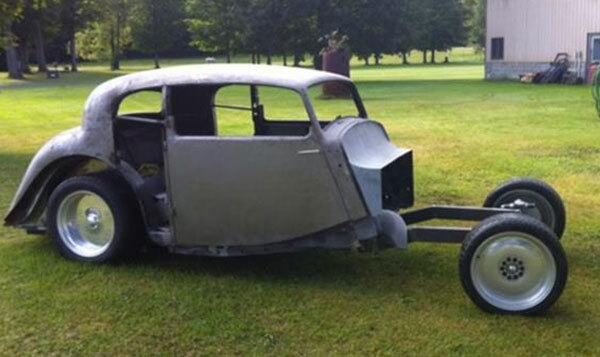 The body and chassis with Rolls Royce engine/engine is for sale for $153,000 as is, unfinished. We would like to complete the project for a new owner as we have our heart and soul invested. 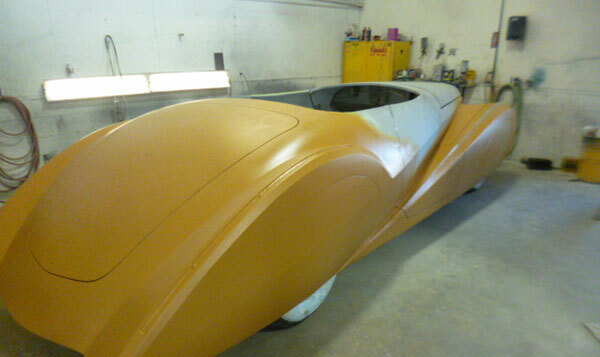 We have been working on this car since the last century! This is an enormous car over 18 feet long. Easily the most spectacular undertaking of all the cars designed and created by DELAHAYE USA. P.S. When we were at the Lake Tahoe Wood Boat Concours we came up with a joke. 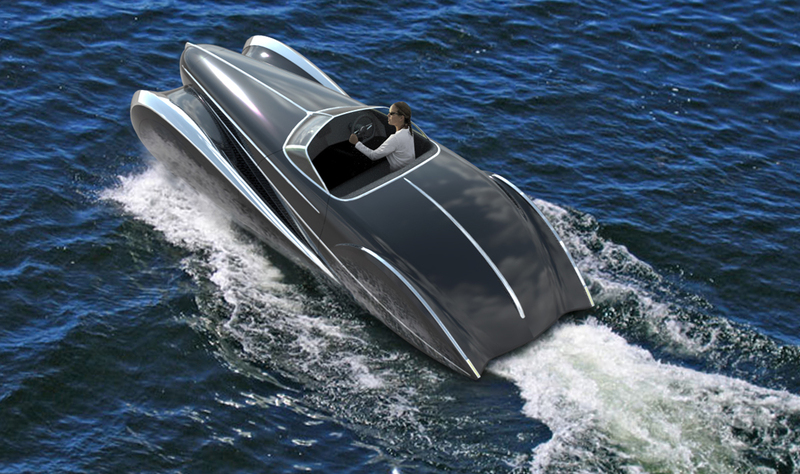 Why not make a speedboat that looked just like the Sultan to tow on a trailer behind the car? People asked us if we were serious. 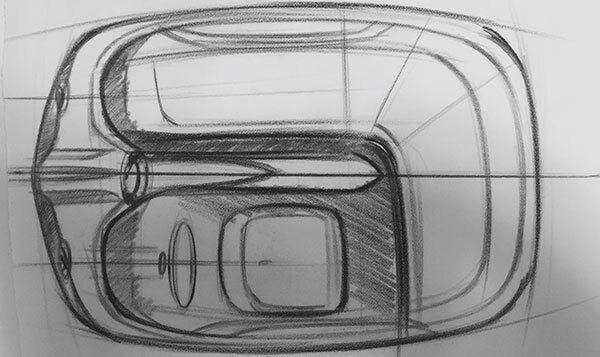 After a little thought, since we have the digital design for the car, we could easily print out a 3-D composite speedboat body that matched the car. All it takes is time and money. Our unfinished, fiberglass-bodied, modern day interpretation of the classic Type 57s Bugatti coupe sitting on rolling chassis. 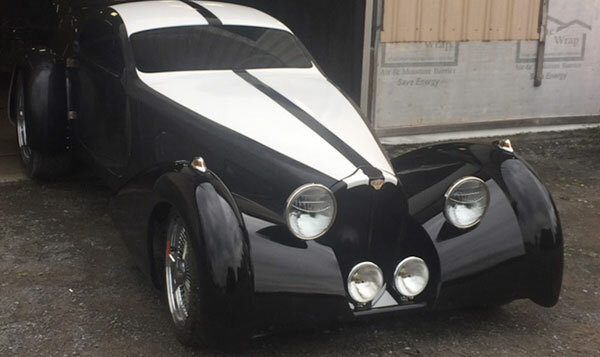 Our NASTY Bugatti body ($13,900) mounted on a new DELAHAYE USA rolling chassis ($14,300) with optional “droop snoot” one piece hood top, two side panels and shorter grille shell ($450). No engine or transmission or but plenty of room for any engine/trans combo you desire. No interior eats or upholstery. A demonstrator we used at car shows to exhibit our glass bodies and rolling chassis. Aggressive laid back curved windshield with no B-pillar “hardtop” styling. Windshield and rear glass installed. No windows in the doors but they are designed to bolt in a Specialty Power Window kit and slide in rear quarter windows. Includes 2 Dayton wire wheels and tires on passenger side and 2 polished mags and tires on driver’s side plus one extra rear mag wheel. 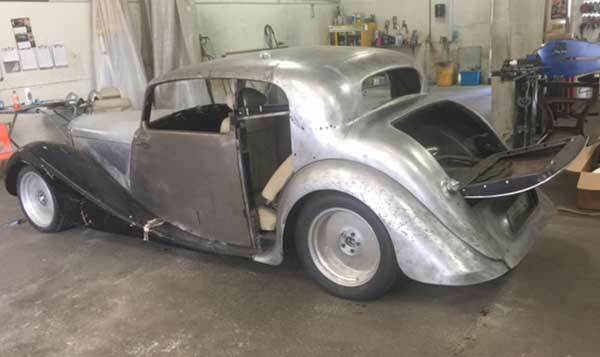 Includes full floor pan & firewall, four fenders, grille shell, one piece hood top and two hood side panels, doors and hinged decklid with a fin. Headlights and stainless grille included and installed. 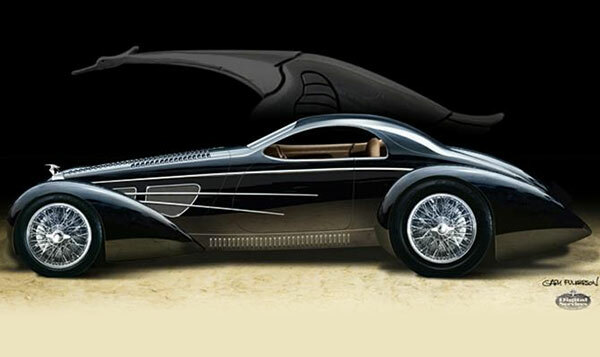 Not a exact replica, but a streamlined, lengthened “Tribute” to Jean Bugatti. Modern frame with Art Morrison main rails specially formed for this car. Kugel Komponents independent front suspension with power steering rack. Coil over shocks and disc brakes front and rear. Narrowed 9-inch Ford rear with triangulated 4-link rear suspension. 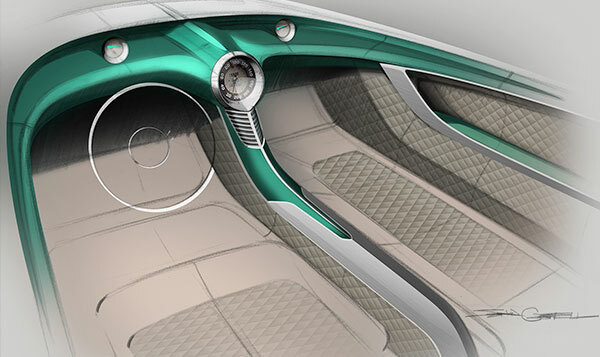 With a 127 inch wheelbase, ten inches longer than the original Bugatti, there is considerably more interior legroom. Leg and headroom for a 7 foot tall basketball player. Borgeson steering linkage, steering column and wheel installed. Interior metal bracing around back of driver’s compartment that reinforces the B-pillars. Doors hinged and latched. 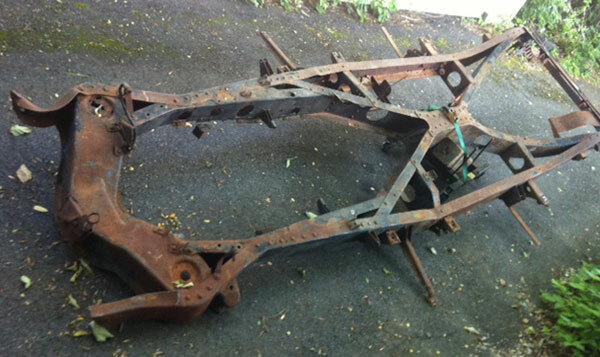 Rolling chassis and fiberglass body including optional “droop snoot” front end. Body in black gel coat finish with white racing stripes painted on. I’ve always loved the styling of Mark IV 1937-’48 Jags. 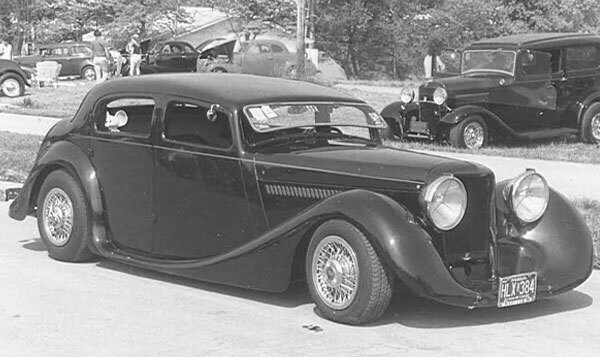 On several occasions I came close to buying one because I saw a radically chopped saloon (4 door) at the Memphis Street Rod Nats four decades ago owned by HOLLIE SWINDLE (attached photo). When I heard a ’47 4-door owned by JAMES HETFIELD (famous lead singer of METALLICA) was for sale, I bought it and shipped it to STEVE’s CUSTOM SHOP in Torrance, CA. There I had panelbeater STEVE HOGUE move the B-post back 10 inches, stretching the length of the front door with the plan to weld what remained of the back door closed. The car is at BAD DONKEY HOT RODS in Hanover, PA. For motivation, I had Gary Brown stuff a brand new supercharged 540 HP LSA Caddy V8 and transmission into it. We are turning it into a 5-window coupe. This was to be my “daily driver”, but because I'm trying to "thin out the fleet", this project is FOR SALE. 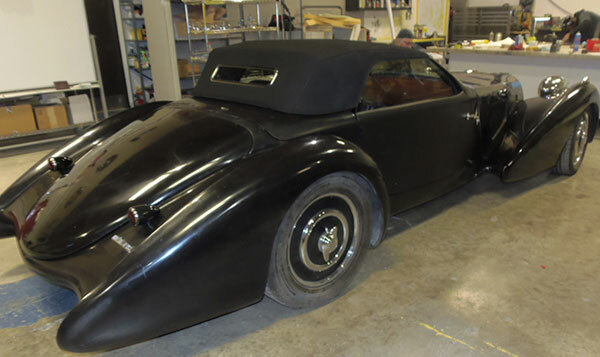 Includes all the sheetmetal, filled roof, hood and side panels by Marcel, wheels, tires, rolling chassis, two interiors (the original ones from James Hetfield plus a set of perfect Mercedes Benz buckets.) Interior wood window moldings, brand new LSA supercharged Caddy, wiring harness and new Chevy transmission, plus a Jag title.